Concentration can be practised in many ways. The object of concentration can be seen or located in any of the many centres throughout the body such as chidakasha (mental space), hridayakasha (heart space), daharakasha (panchatattva meditation), in any of the chakras or in front of the body. Concentration can also be done on the different parts of the body, the physical processes, the stillness of the body, relaxation or tension of the body. The breath is also used as the object of concentration. Almost any object can be used as the basis for concentration. Once you have selected an object, you should use the same object in your practice day after day. The object should come to your attention spontaneously. For some people the object appears by itself in the form of a vision or a dream. This is the best natural selection. Other people, however, will have to find a suitable object for themselves. You can concentrate on any great saints, any light, any sound, colour, form, thought, or anything you like, but one thing should be clearly understood. When you take up the practice of concentration it is not necessary to select a religious symbol. Sometimes a thought which makes a greater impression on your consciousness can be used instead. There is no use in fighting with the mind. During concentration practice you may be trying to think of a religious symbol, but your mind does not agree because that is how the mind is conditioned. When you try to concentrate on something which is alien to this conditioning, the mind pulls away. However, when you think about very ordinary things there is no distraction. When you try to concentrate on the wrong symbol, distraction comes and the confrontation begins. It is very necessary to understand that when you are practicing concentration, there should be minimal confrontation in the mind. There is no use fighting with your own mind. Who is fighting with whom? There are not two minds. Consciousness is one, but for the sake of diversity there are various vrittis, patterns or modifications of the mind. When you confront yourself you are actually creating a quarrel between your own vrittis. When this confrontation between your own vrittis becomes intense, then you have a schizophrenic attack. Most mental patients are the victims of their own mind. Therefore, if you are not able to concentrate by using any of the suggested methods, then choose your own. The important thing is that the symbol you choose should become so compelling that you mind is automatically drawn to it and completely integrates with it. When you practice in this way then you will enter into concentration easily. When you practice meditation you can also use distractions as objects of concentration, just like the wise yogi in story. There was once a king who was very attached to his riches, but still he wanted to meditate for he was beginning to see the worthlessness of his vast wealth. A yogi gave this king instructions. The king sat down to meditate in earnest, but whenever he tried to fix his mind upon the eternal it went blank. Then, without knowing it, his imagination began to hover around his beautiful gold bracelet which he was particularly fond of. Before his admiring gaze, the bracelet began to sparkle in all the colours of the rainbow. As soon as he found himself in that fantasy, he fought his way back to God. But the harder he tried to fix his mind upon God, the greater was the frustration that he experienced. God invariably changed into the bracelet in his mind. PS- Find an experienced Bihar Yoga Teacher for guidance. This day, it became special. There are a few instances in life which effect and bring a unique experience with them. This case became one of them. I take Yoga sessions and counselling (if required) for post-natal & pre-natal ladies in Jehangir Hospital, Pune. This day was a regular day and I went to General ward on 3rd floor. After completing that section, I walked in the Zodiac Ward which has recently been renovated and there is a very positive feeling, generally. I knocked on the door of a prenatal state lady who I was told had PRoM (Premature Rupture of Membrane) 2 days back. As I opened the door, I saw a beautiful young lady on the bed who had a very anxious and worried look on her face but greeted me with a pretty smile. Although we were meeting for the first time, both of us instantly connected. Her husband offered me a chair and I introduced myself. She then told me her current status- “The Gynaecologist had told that as water was still leaking, she’ll have to terminate my pregnancy which is 25 weeks old!” This being her 1st pregnancy, she obviously was in lot of stress. She had a constant question on her face – “Why Me?” While narrating, she got very emotional. I sensed her tension which was a big addition to her current state and that it would only worsen her situation. She nodded almost immediately as I told her about the Yoga Relaxation and how after Relaxation, she would be able to calm down her anxiety. At that moment, I wanted her to relax at all costs. So, I gave her a full Yogic Relaxation and asked her to think of a positive Sankalpa (Resolve)! She completed the whole practice very nicely following each word said by me. Totally Connected!!! After she opened her eyes with a beautiful smile, her face was very peaceful. I told her that a change of thought pattern mentally, & being positive, would help her situation physically. And she must connect herself to her Baby, feeling the strong connection, direct the Baby. The Baby will listen to Mom’s! I believe very strongly that we humans, have the capability of overturning any situation from negative to positive and can control any physical state just by using our mental power. Our talk was a long one! By the time I waved her goodbye, she was happy. Next day, when I went to see her, she was already waiting and then I introduced Mahamrutyunjaya Mantra to her and told the one important benefit of this life-saving Mantra- the power of reviving health & life. She and her husband were very prompt to learn the mantra. I asked them to do it at least twice every day. Day next, She had her Sonography and the couple looked very happy as the water level had risen and no infection, which was a great sign of retention. But slight leakage of water was still there. In this day’s practice, I gave her full Yoganidra with her Sankalpa. By this day, she had grown very strong mentally and emotionally which was healing her physical state fast. Her gynaecologist also told them to wait, as her condition was improving. Meanwhile, I talked about PRoM condition to one of my childhood friends, who is a renowned Gynaecologist, running her own hospital in Rajasthan very successfully. She explained the situation in detail to me and helped me clear all my doubts. Then, I explored Internet too, which says that premature delivery of about 27-28 weeks success rate is 67% now, but still, each case is individual , unique, and absolutely depends on the new-born Baby’s response to external medical help after it’s premature delivery. I had to explain this to the couple, so that, they could prepare themselves mentally for the situation that might come up in near future. ● One, this young pretty lady gained confidence and was mentally prepared to deal with the upcoming situation. ● Second, she had accepted her condition and was ready for good or worse. When situation is out of our control, we must connect ourselves to the cosmic power which helps our positive energy to recollect and channelize. So, I gave them the chanting of the “32 names of Durga” which are extremely powerful and have the capacity to remove distress from life. While she was still in hospital, I had to go out-of-town for some personal work. While I was away, I received the news of her preterm normal delivery which was a pleasant surprise (without inducing epidural), and that the Baby was small but healthy, responding well to the external treatment and care. ‎The couple has been in constant touch with me since then. The Baby is still in Neonatal Care and Doctors have started to give Mother’s Milk feed to the Baby. I sincerely pray every day for good development of the Baby, with the positive hope to hear the news of the Baby coming home soon! ‎I feel extremely blessed to the great knowledge of Yoga! Sunderban Yoga Studio is a part of Sunderban Resort & Spa at Koregaon Park, Pune which is surrounded by greenery & positive vibes. It has been dedicated for traditional Yoga with the purpose of benefitting the people for physical health & ailments, mental distress and also for spiritual seekers. 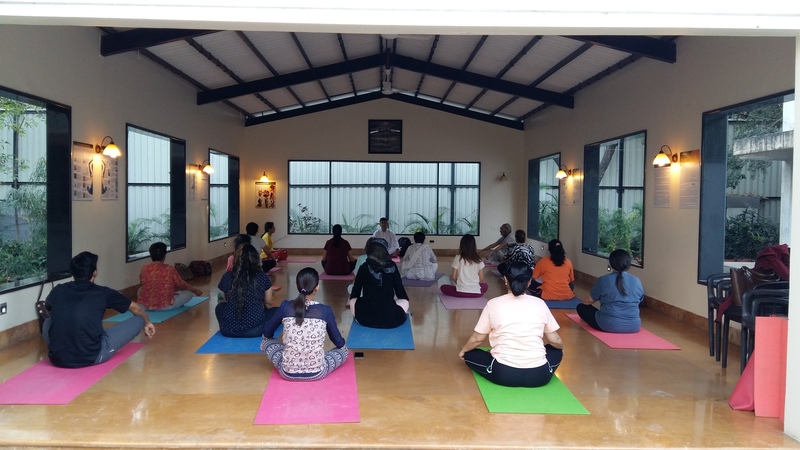 Sunderban Yoga Studio, Pune is a great location for Yoga lovers as well as those who are in trouble and suffering whether on physical or mental level. The kind of packages, practices, capsules and techniques that we introduce, allows a Yoga practitioner to open up, and let the purification of body and mind take place. Prashant Pandey and Ruchira Pandey are there as Yoga Teachers, Therapists & Consultants. They have profound and vast teaching experience of 22+ years with various groups & individuals in Pune and in the country. They are also working as Yoga Therapists in Jehangir Hospital, IT Companies and Educational Institutions and are dedicated to spread the message of YOGA. The word ‘concentration’ means one-pointedness. Just as we need a sharp pencil to write with or a sharp knife to cut with, the mind also must be sharpened through the practices of concentration. We cannot cut with a dull knife or write with an unsharpened pencil, because the pressure applied is spread over too large an area. It is not concentration. The importance of a concentrated mind in everyday life is widely recognized, but the ordinary mind is not functioning in a concentrated way. It is dissipated, also spread over too large an area and covering too many points. Therefore, we are not able to utilize even a fraction of our potential mental power. We know many things in life, about our work, our families, our society, our environment, history, science and politics, but we do not know how to wilfully control and direct the mind. The power of concentration has not been developed in most of us as part of our early teaching. As we grow older the mind becomes more and more dissipated as the tensions and worries mount. This results in increasing loss of mental acuity, wrong decisions, ineffective management, poor memory and finally senility. We may be masters of technology and of the external world but we are not masters of the mind. Somehow that inner technology which gives us control over the mental functions is eluding us completely. Control over a machine means that are able to start it, speed it up, slow it down and stop it whenever needed. The same thing is also required of a disciplined mind. The disciplined mind is one which thinks only when you will it and about what you decide. If you want it to think fast or slow or stop thinking altogether, it immediately complies. The thoughts which enter a disciplined mind are immediately organized and directed. They have no power to sway the mind in one way or another. If we examine the lives of yogis, sadhus, sannyasins, saints and mystics, we will see that they all have one thing in common. They lead intensely one-pointed and concentrated lives, dedicated totally to the ideal or purpose which they regard as the highest goal. They gain control over themselves and their minds by regular, steady practice. Through their power of concentration they gradually merge the mind into their prayer or meditations until they are able to achieve a state of perfect mind control. Usually on meeting such a person, our first impression is one of deep inner peace, steadiness and self-control. The ability to concentrate is the root of all higher qualities in man and it requires strenuous effort. To develop a concentrated mind is harder than earning a degree. The average person is not born with the ability to concentrate, so it is necessary to change our nature in order to create something which was not there before. This is different to studying concepts of philosophy from books and lectures. Concentration is something which must be practiced and discovered personally to gain full benefit. The essential thing for developing concentration is regularity in practice. However, before we start practicing concentration, we must develop an idea of the broad range which this stage of mental development covers. The practices of concentration and meditation are codified in the yogic and upanishadic texts. This is a subject which should be studied and researched to obtain the best results. Concentration is not a superficial practice. It involves diving deep into the inner dimensions of the mind and consciousness, in order to do this we need three things: (1) correct method, (2) correct guidance and (3) correct understanding.